Are you part of the generation that remembers when a few old blankets were the makings of a perfect hideout, and the most drama you had to deal with was whether to baseball, ride your bike, or pretend you were a cowboy? If you are, then it can be quite a challenge to see your perfectly healthy kids curled up on their bed with an iPod in the middle of a beautiful summer afternoon. Believe me, I feel your pain! A 2010 Kaiser Foundation Study found that children and teens on average spend almost 8 hours each day on entertainment media. The naked truth is that technology is here for the long haul, and your child’s love of it isn’t going to go away anytime soon. Fortunately, there are some simple things that you can do to break their addiction to electronics and rekindle their adventurous spirit. First, encourage them to explore those things that interest them, and to do so in a hands-on manner. If your child loves science, then get him/her a simple science experiment kit, and let them learn first hand. If they loves bugs, get them a bug magnifying kit and let them get down and dirty in the mud. If it’s a fascination with the outdoors, then a basic survival book and a Pocket Tool will be the beginning of a life-long love of the outdoors. It’s been proven that on the whole kids, especially boys, thrive when they can learn by “doing”, and there’s no better time to start than when they are young and full of curiousity. The second thing you can do to inspire your child’s love of learning and adventure is through story-telling and reading. Inspiring true stories such as I Pledge Allegiance or The Civil War Graphic Novel 2-Book Set can inspire your children to do and achieve more than they ever thought possible. Fictional stories about heroes and warriors can broaden their world and teach them to dream big and reach for their goals. Third, be a good example. Be active yourself, so the next time you encourage your couch potato to get outside and explore the world they live in they can’t say, “But you never do!” Better yet, be active and learn together as a family. Take the time for a family hike or an afternoon together at your local historical society. Go camping for a weekend or even a night in the backyard. Whatever your chosen activity, use it as an opportunity to learn and grow together as a family. A love of adventure may start when you are young, but a true adventurous spirit never withers. To find thousands of ways to inspire a passion for learning and to ignite an adventurous spirit within your children, visit www.jmcremps.com. 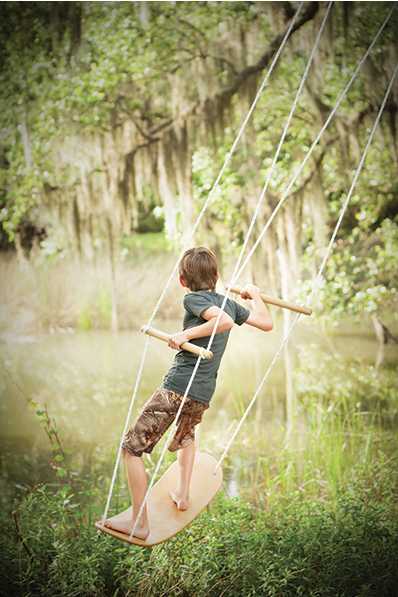 Request FREE copy of our Adventure Guide Catalog today, and you’ll discover why over 100,000 families rely on JM Cremp’s as their go-to resource for hands-on activites, ideas and toys to enhance active imaginations, fun gear for outdoor adventures, parenting resources, and educational tools for creative learning. The point of all this is to swap your child’s addictive electronics with a few simple replacements that are engaging, appeal to their interests, get them moving, and challenge their minds. It doesn’t have to be expensive or time consuming, but it will take a little effort in the beginning. Then again, most things that are rewarding take some effort, but they sure are worth it in the long run!